Denali (Mount McKinley), located in Denali National Park and Preserve is the tallest mountain in North America. Located in south-central Alaska, the mountain's peak is 20,310 feet. Its base-to-peak rise is the largest of any mountain situated entirely above sea level. In August 2015, with President Barack Obama's approval, the U.S. Department of the Interior officially renamed the mountain Denali. Five large glaciers (Peters, Muldrow, Traleika, Ruth and Kahiltna) flow off the slopes of the mountain. 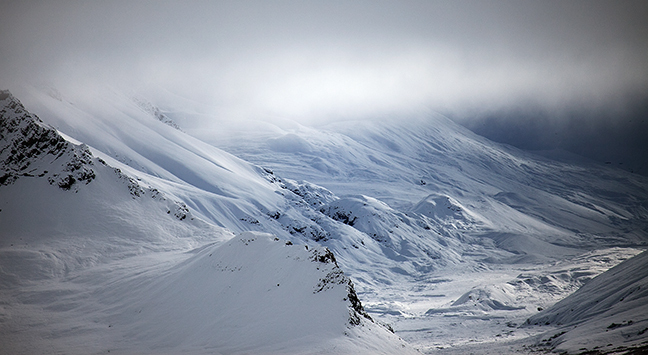 The Kahiltna, with a length of 44 miles, is the longest glacier in the Alaska Range. 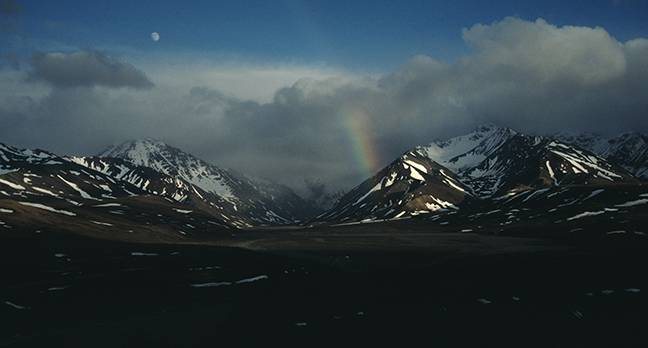 A rainbow forms as the moon sets over the Alaska Range as seen from Polychrome Overlook at Mile 46 of the Denali Park Road. 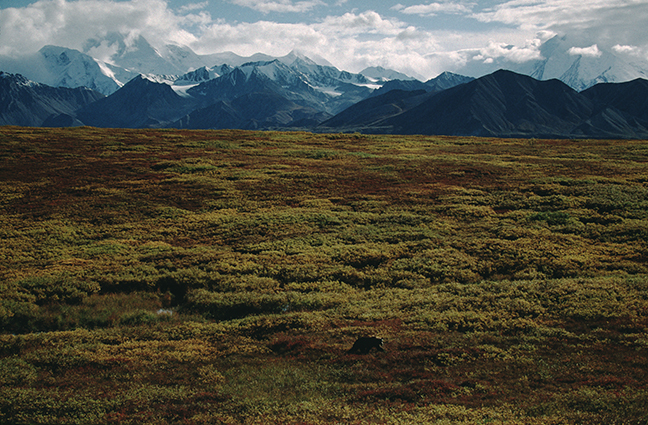 It is named after the area's multi-colored bluffs high above the glacier fed tributaries of the East Fork of the Toklat River in the tundra region, where a layer of permanently frozen subsoil (permafrost) exists. 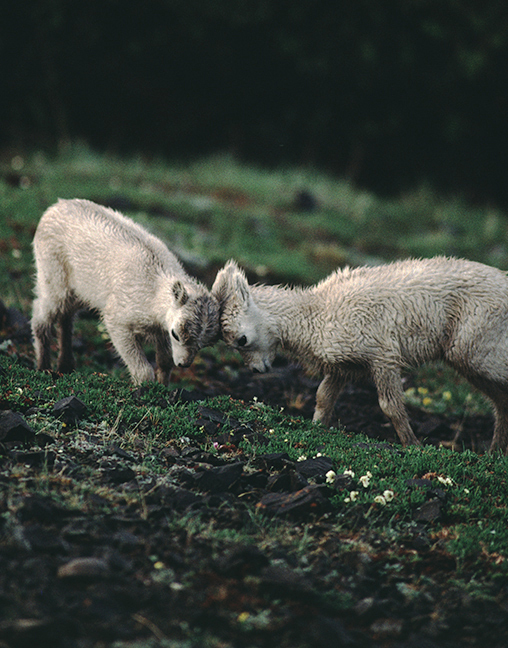 Mountain goats are members of the antelope family and live at elevations of 10,000 feet and higher. 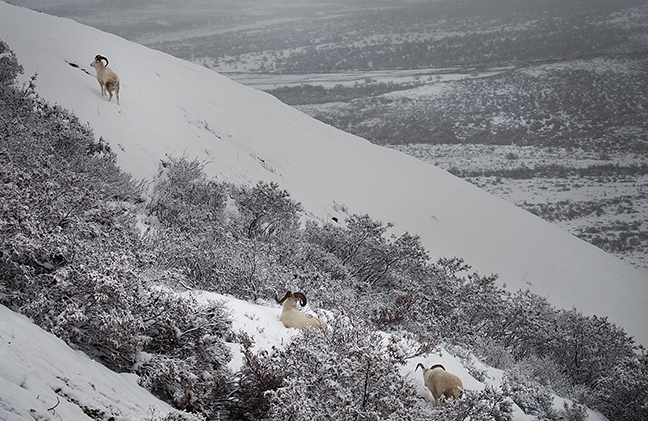 Goats that live above the timberline during the summer remain there during winter with only short excursions to lower elevations to feed on the tips of trees and other vegetation. In the spring, a nanny goat usually gives birth to a single kid, which will be on its feet within minutes of birth. 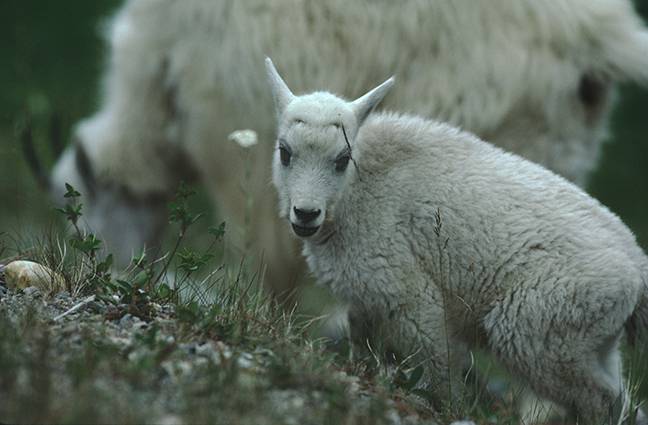 Mountain goats are herbivores and spend most of their time grazing, eating plants, grasses, mosses and other alpine vegetation. 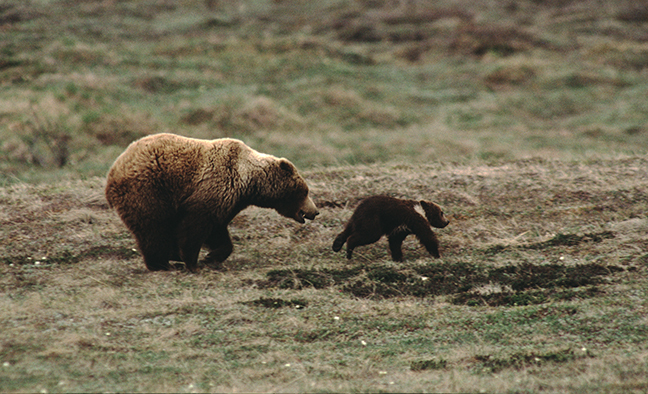 Females, called nannies, spend most of the year in herds with their kids, while males either live alone or with two-three other males. 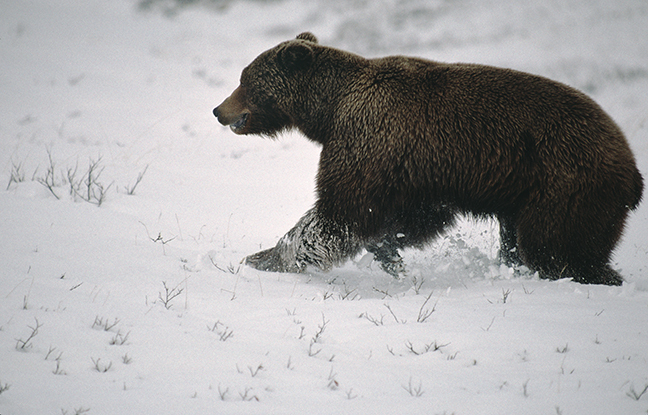 Only Brown Bear sows without cubs breed, most often in the spring. A dominant boar may mate with several sows a year and sows may breed with more than one male. A pregnant female benefits from the delayed implantation of the blastocyst into the wall of the uterus, allowing her to expend little energy on the developing fetus until the beginning of winter when she goes into hibernation. 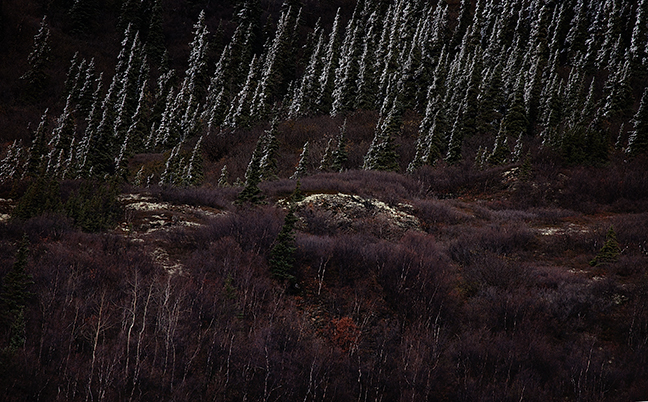 A lone grizzly traverses the scrub brush along the Denali Park Road between the Eielson Visitor Center and Wonder Lake on an autumn afternoon. The road parallels the McKinley River with views of Mt. Mather, Mt. Deception, Mt. Brooks, Mt. 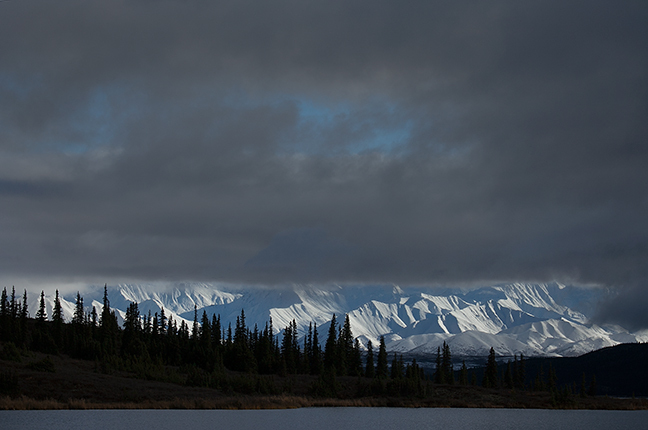 Silverthrone and the South Peak of Denali (on a clear day). 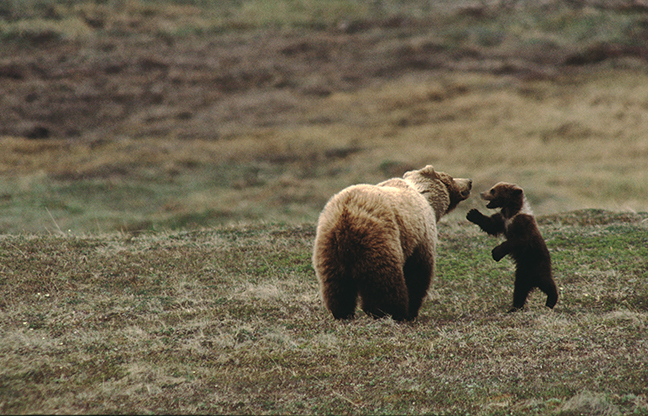 In Denali, bears typically den in late October or early November. On average, sows spend up to seven months in hibernation and can lose up to 100 lbs. during that time. Males usually hibernate for five to six months. 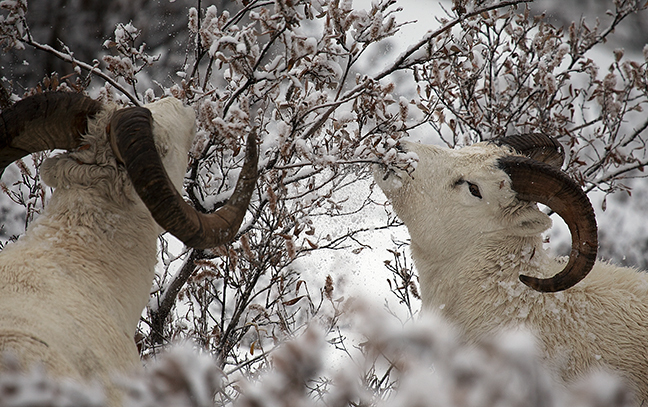 When they emerge from their dens, the terrain is often snow covered and bears dig for roots, search for winter kills and devour early spring berries and grasses. The Willow Ptarmigan is the state bird of Alaska. 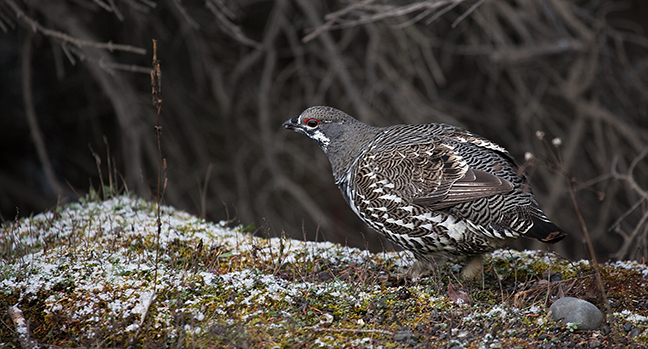 It is an arctic grouse that displays seasonal color changes from a mottled brown or gray in summer to snow white in winter as camouflage from predators. 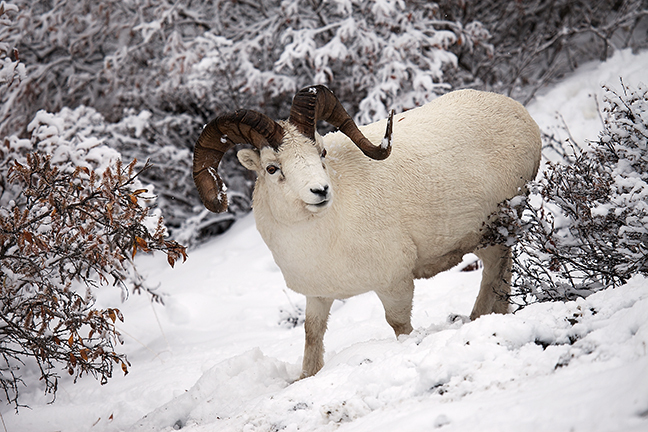 In winter, its feet are heavily feathered which improves its ability to walk through fresh snow. 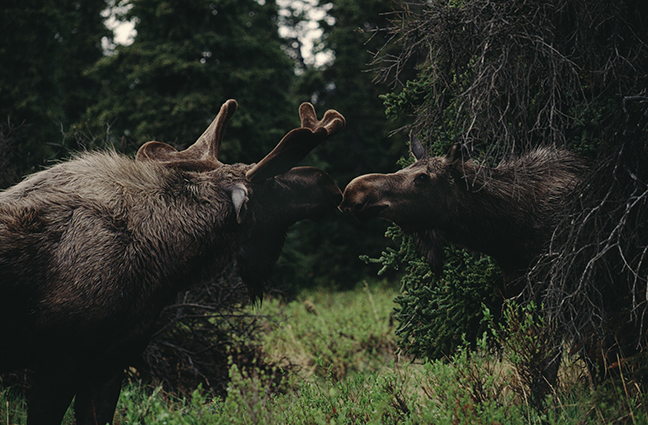 It is herbivorous and forages for buds, twigs, leaves, seeds and berries, although in Alaska it feeds mostly on willows throughout the year. 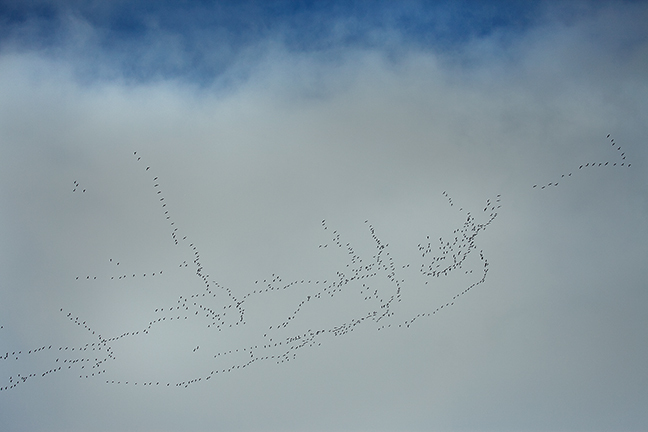 Sandhill Cranes begin their fall migration over the Wonder Lake region of Denali National Park. They are part of the Midcontinent or Central Flyway flock that gather annually and head to their wintering grounds in the Southwest. Their migration corridor is shaped like an hourglass, narrowing over the Platte River basin in Nebraska. During migration and on their wintering grounds, their flocks number in the tens of thousands. 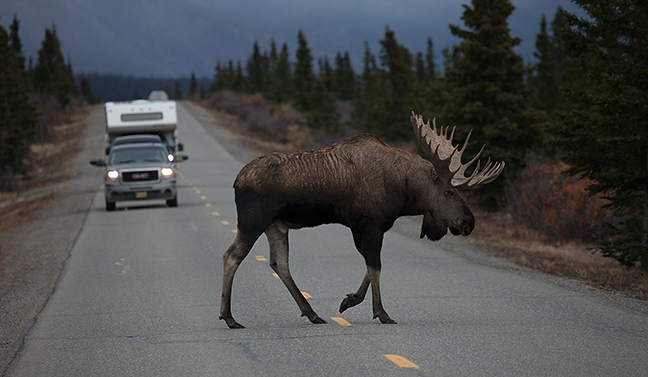 It used to be fairly common to see Gray Wolves along the Denali Park Road, as three known packs, Grant Creek, Nenana Canyon and East Fork, denned nearby. 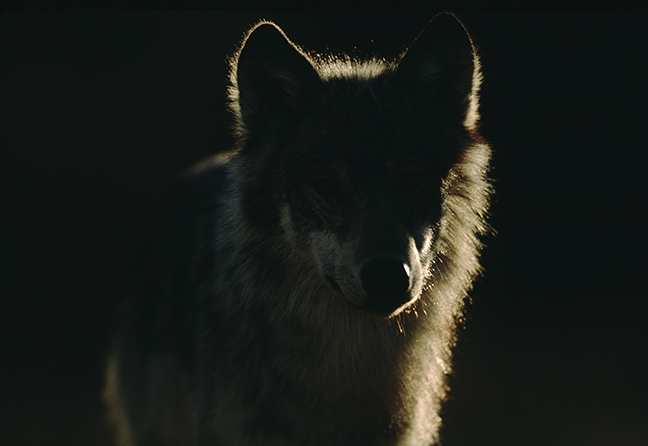 However, in spring 2015, Park biologists counted only 49 wolves in the Park, as these packs have been decimated by trapping and hunting on state lands east of the park boundary. 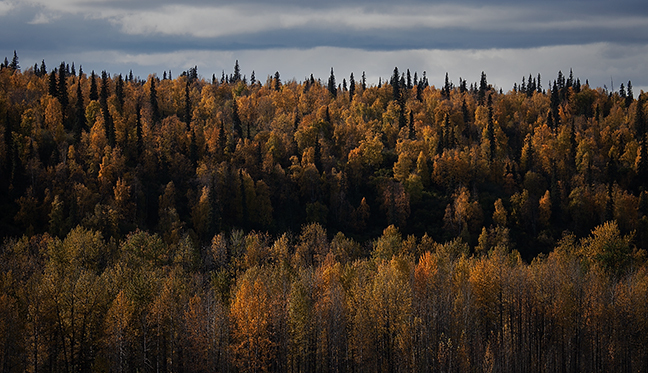 The Alaska Board of Game eliminated the no-trapping, no-hunting buffer in 2010 and has turned down repeated emergency petitions requesting reinstatement of a wolf protection zone along the Park’s northeastern edge.